If one smokes a smokeless cigarette, can they still be considered to be smoking? This zen-like conundrum is causing a number of health experts, transportation companies and government authorities to scratch their heads, furrow their brows and maybe even soothe their anxieties with a cigarette - smokeless, of course. 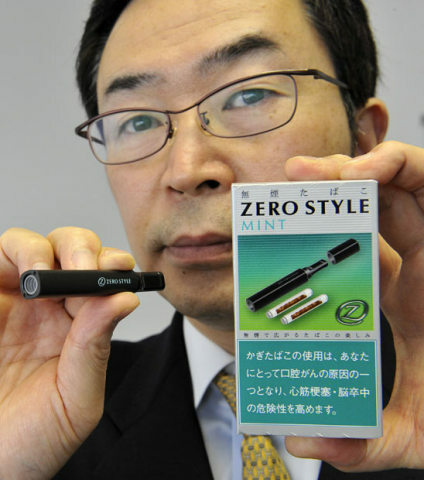 "Zero Style Mint," newly introduced in the Tokyo metropolitan area by Japan Tobacco, Inc., is not your father's or grandfather's cigarette. Though it contains tobacco, the ground leaves are sealed inside cartridges that in turn are placed into a reusable plastic tube when the user desires to "smoke". 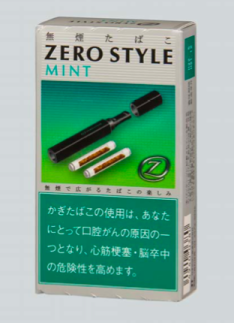 JT is marketing twin-cartridge packs of Zero Style Mint for 300 yen, or around $3.25 per package. 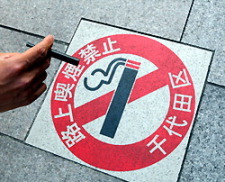 Although municipal governments who have enacted no-smoking bylaws seem to be excusing smokeless cigarettes from enforcement, Japan's two largest airline companies are split on the matter. Says a JAL spokesperson, "We have no complaint with customers using smokeless cigarettes, including on international flights." ANA, on the other hand, states "Smokeless cigarettes cannot be smoked onboard flights. Even if they're smokeless, they're still cigarettes." Japan's major rail corporations are also split on how to classify products like Zero Style Mint. The matter may finally decided by health authorities who have always aimed to protect the public at large from the dangers of smoking. In the case of smokeless cigarettes like Zero Style Mint, the danger is restricted to the user: those who seek to ban or restrict smokeless cigarettes could find themselves involved in personal liberty issues.